P HOENIX, Ariz. - There will be a new face at Northern Arizona University football games this fall – only this face will be on a robot on wheels. Mayo Clinic will be working with NAU to test the feasibility of using a telemedicine robot to assess athletes with suspected concussions during football games as part of a research study. With sophisticated robotic technology, use of a specialized remote controlled camera system allows patients to be "seen" by the neurology specialist, miles away, in real time. During the study, the robot equipped with a specialized camera system, remotely operated by a Mayo Clinic neurologist located in Phoenix who has the ability to assess a player for symptoms and signs of a concussion and to consult with sideline medical personnel. The first time the robot will be used in a game is this Friday, Aug. 30 when NAU kicks off its season against the University of Arizona in Tucson at 7 p.m. (MST). "Athletes at professional and collegiate levels have lobbied for access to neurologic expertise on the sideline. As we seek new and innovative ways to provide the highest level of concussion care and expertise, we hope that teleconcussion can meet this need and give athletes at all levels immediate access to concussion experts," said Bert Vargas, M.D., a neurologist at Mayo Clinic who is heading up the research. This study would be the first to explore whether a remote neurological assessment is as accurate as a face-to-face evaluation in identifying concussion symptoms and making return to play decisions. Mayo Clinic physicians will not provide medical consultations during the study, they will only assess the feasibility of using the technology. If it appears feasible, this may open the door for countless schools, athletic teams, and organizations without access to specialized care to use similar portable technology for sideline assessments. "As nearly 60 percent of U.S. high schools do not have access to an athletic trainer, youth athletes, who are more susceptible to concussion and its after-effects, have the fewest safeguards in place to identify possible concussion signs and symptoms at the time of injury, Dr. Vargas says. "Teleconcussion is one way to bridge this gap regardless of when or where they may be playing." Others involved collegiate sports agree. "At NAU, our primary goal is to provide an outstanding student-athlete experience culminating in graduation," says Dr. Lisa Campos, vice president for Intercollegiate Athletics at Northern Arizona University. "We charge our staff to research the most current and best practices to ensure the safety and care of our students. Partnering with the Mayo Clinic in its telemedicine study will further this research and potentially improve diagnosis for rural areas that may not have access to team doctors or neurologists. The study allows the NAU Sports Medicine Staff and team doctors to continue to make all diagnoses and return to play decisions for our students, while investigating the effectiveness and efficiencies of telemedicine. 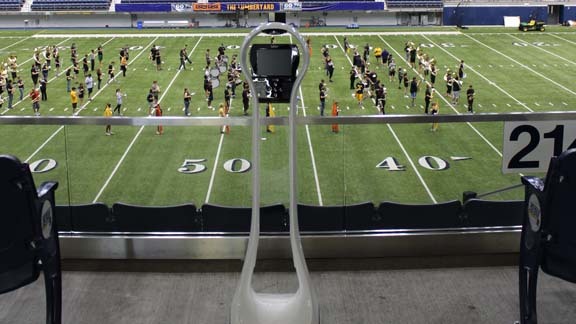 We are excited to have the teleconcussion robot on our sideline this fall." "There were a number of examples last football season where college football players clearly demonstrating concussion-like symptoms were quickly thrown back in games or weren't even taken out of the game for an evaluation," said Ramogi Huma, executive director of the National College Players Association. "College football players are in desperate need for independent concussion experts on the sidelines, and this study could help make that safeguard a reality." Mayo Clinic in Arizona first used telemedicine technology with the telestroke program in 2007, when statistics revealed that 40 percent of residents in Arizona did not live in an area where they were availed of stroke expertise. Mayo Clinic was the first medical center in Arizona to do pioneering clinical research to study telemedicine as a means of serving patients with stroke in non-urban settings, and today serves as the "hub" in a network of 12 "spoke" centers, all but one in Arizona. Since the telestroke program began nearly 3,000 emergency consultations for neurological emergencies like stroke between Mayo neurologists and physicians at the spoke centers have taken place. 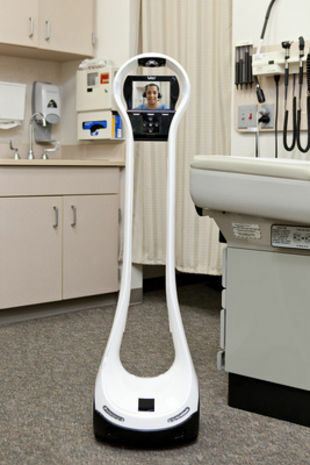 In 2011, Mayo Clinic expanded its telemedicine evaluations to include concussion evaluations. Concussion experts at the Mayo Clinic Comprehensive Concussion Program in Arizona coined the term "teleconcussion" and described the concept as an effective means to assess concussed patients in a case study published in the December 2012 issue of Telemedicine and e-Health. "Teleconcussion is an excellent new example of connected care in action, as athletes with suspected concussion, anywhere and anytime, can be effectively connected to Mayo Clinic concussion knowledge and expertise," says Bart Demaerschalk, M.D., co-author of study, Director of Mayo Clinic Teleneurology and Telestroke, and Chair of American Academy of Neurology Telemedicine Work Group. Mayo Clinic is a nonprofit worldwide leader in medical care, research, and education for people from all walks of life. For more information, visit www.mayoclinic.org/about/ and www.mayoclinic.org/news.